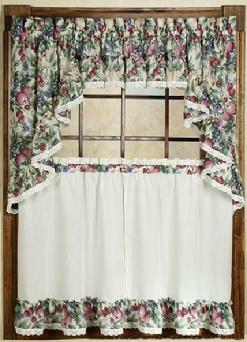 The Victoria Park Bradford Valances are 70" wide and 15" long. 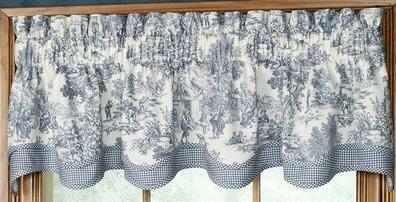 The Victoria Park is a elegant classic toile print available in colors blue, red & black. They feature a 3" heading and 3" rod pocket and are double layered and scalloped. One valance will fit a window approx. 30" to 48" wide. 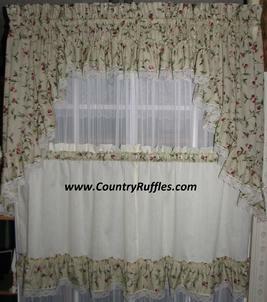 For wider windows use multiple valances. Made in the USA! Click pictures at the left to enlarge. Harvest Fruit by A.L. Ellis Made in the USA. 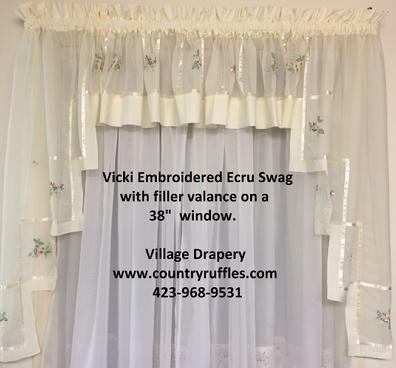 Vicki Embroidered Voile Swag with Valance. Available in Swag, Valance and Tier. Please allow 1 to 2 weeks for shipping for the Vicki. Imported and Machine washable cold, gentle cycle no bleach. 100% Polyester voile and ribbon with 65%poly/35% cotton header and bottom. The Vicki features 3 different embroidery patterns on a voile sheer fabric with a ribbon blocking off the sections of embroidery. Available in either WHITE or ECRU.